Impressive specs on Moto's next flagship? 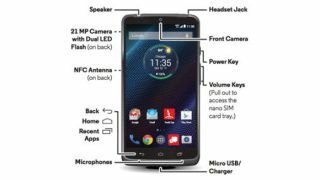 A very legitimate-looked user manual for the unannounced Motorola Droid Turbo has been published online. All 70 pages of it. The Droid Turbo was first mentioned back in August as one of a slew of new Motorola smartphones that could grace us by Christmas. Motorola has yet to officially unveil the device, but this user guide reveals everything you could want to know about the Droid Turbo. Credit has to go to MotoFirmware for the leak, though its ultimate source remains unclear. On first mention, the Droid Turbo was said to be packing a Snapdragon 805 chip, 3GB of memory, and a QHD screen. In addition it looks like the Turbo has a 5.2-inch display and a 21-megapixel rear camera and comes with Motorola's ultra-fast Turbo Charger. "Your new DROID Turbo by Motorola has it all - a big bright, ultra high-definition display, blazing speed and performance, and a high-capacity long lasting battery," the manual explains. Pore over the manual to see if anything else can be gleaned, or to learn how to turn the Droid Turbo on and off and other extremely helpful tips.